DO NOT fertilize during high heat, humidity, or drought as grass can burn. DO NOT apply fertilizer on damp grass – this includes dew – only apply when grass is dry. If possible, spread fertilizer before a rain. The best time of day to fertilize is the late afternoon or early evening. DO NOT apply in direct hot sunlight or the grass can burn. MORE IS NOT ALWAYS BETTER! Apply sparingly with a proper spreader to ensure even application, or grass can burn. Make sure spreader is adjusted properly; otherwise you could end up with striping or uneven colour that would detract from the appearance of the lawn. To ensure an even spread, divide the fertilizer and spread half in one direction and the other at right angles to it (think of a checkerboard pattern). Understanding and implementing a well-balanced fertilizer program is one of the most important factors in maintaining an attractive healthy lawn. Lawn grasses that are under fertilized tend to be thin with poor colour. Lawns that are over fertilized tend to have thatch problems and are more prone to insect and disease damage, whereas a properly fertilized lawn is able to repair itself quickly, thereby minimizing any evidence of insects. The goal of a good fertility program is to produce a reasonable amount of top growth, but not at the expense of root development creating an unhealthy lawn. The grass plant needs more nitrogen than any other nutrient: Nitrogen is part of the chlorophyll molecule and helps to give the lawn its deep green colour. However, excessive nitrogen also tends to promote high leaf growth rates at the expense of root growth. Therefore, look for slow-release forms of nitrogen (for all but late fall applications). Phosphorus is responsible for the energy transfer systems in the plant and is generally required in much smaller amounts than nitrogen or potassium on an established lawn. The exception is for newly established lawns, by seeding, or sodding, when the need of phosphorus is higher. Potassium has a lot to do with good cell wall development and the plant’s ability to withstand stress, disease, and insect damage. Magnesium is part of the chlorophyll molecule which aids the plant roots utilize other nutrients. The timing of fertilizer application is determined by the total amount of fertilizer you wish to apply to your lawn. Table 1 shows the suggested timing of fertilizer applications based on the number of yearly applications. As you will notice, the Late Summer/Early Fall is the time every lawn should be fertilized. Late fall fertilization with a quick release nitrogen fertilizer is beneficial for home lawns. Apply when the lawn has stopped growing but is still green. It increases fall and spring root growth, promotes a thicker lawn, and results in an early spring green up. The lawn will green up earlier in the spring and will not give the rapid flush of shoot growth that occurs with spring-applied nitrogen. Prior to seeding, fertilizer can be added to the soil to enhance its nutrients. If choosing to do this, a very LIGHT application should be raked into the soil. Then wait at least 4-6 weeks after germination before applying more fertilizer. A good rule of thumb is to wait until the lawn has been mowed at least once, then apply very sparingly. Lowest rates listed are the strongest application. 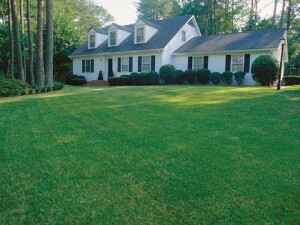 Applying it to an area smaller than the minimum square footage application can burn the lawn. What are the numbers on the bag? During the year grass and plants experience different stages of life; during each stage different amounts of nutrients are needed. Fertilizers are composed of 3 vital plant nutrients; Nitrogen (N), Phosphorus (P2O5), and Potassium (K2O). Nitrogen promotes dark green colour, leaf and blade development, and top growth – anything above the soil line. Phosphorous is important for root and rhizome development and promotes plant maturity and Potassium contributes to the general strength and vigour of the plant. It can also increase wear and drought tolerance as well as hardiness against winter injury. The percentages of each nutrient is the number on the bag – i.e. in a 28-4-8 fertilizer 28% of the bag is Nitrogen, 4% of the bag is Phosphorus and 8% of the bag is Potassium. The remaining amount is filler – and you must always have a certain percentage of filler in order for fertilizer to spread evenly.